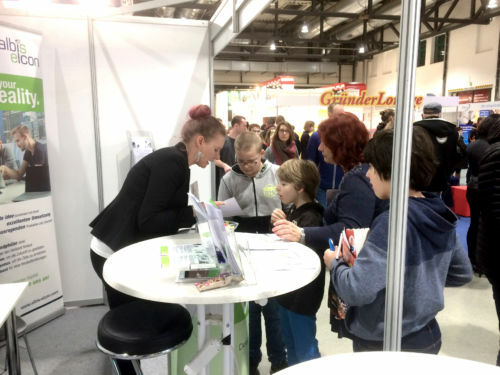 In order to answer these and other questions and to make pupils, students and those seeking employment aware of career opportunities at albis-elcon, we have been participating in three career and recruiting fairs in January 2018. We were able to provide visitors with insights into various training opportunities and into the world of work at albis-elcon. „During the events in Chemnitz, Dresden and Limbach-Oberfrohna, we have successfully seized the opportunities to present albis-elcon both as an attractive employer and training company. We are grateful to our cooperation partners, namely Chemnitz chamber of industry and commerce, the City of Limbach-Oberfrohna, as well as the regional district of middle Saxony for organising the events and enabling our participation. Until now, we are lucky to already have received several applications for our vacancies and training and internship offers.“ Patrick Morgner, HR-manager, sums up. At all events, teams of HR representatives and apprentices have been actively involved and numerous career counselling talks with pupils and their parents were carried out. „Representing my training company at a big career fair was a very exciting task for me“, Melina Fuhrmann (electronics technician trainee) reports about Karriere Start 2018 in Dresden. Her apprenticeship colleagues, Tim Welker and Saskia Wiegner refer to their experiences with the visitors: „The youngest finisher of our practical soldering exercise was a fifth-grader“. The next opportunity to meet us at similar events will be as early as March, 17, 2018: We will be showcasing our company and our career prospects at the famous Sachsenring circuit, where the event ‚Beruf und Bildung am Sachsenring’ will take place.